The Nation’s longtime architecture critic Douglas Haskell commented on the multiplicity of influences evident in its design. The hall has a mighty, swift sweep. Hesitation there is none. It is as if, when you pushed aside the curtain, there had been a rocketing of space. All at once there is a vast firmament overhead, and a great distance stretching out under it. It is not the sensation of a dome. The dome, as you come under it, after a long approach, sensing its presence by the circle of light, opens up far overhead, majestic, poised, centered, floating, serene. This huge vault, however, is different. It has focus and energy…. This vault is a delight. Not only the vast space: this nervous energy, this swift radiation. There is something about it that fits. It stands for our thoughts. Picture the Greek, with his serene colonnade topped by the low triangle of his pediment. It is measured and self-contained. Picture the Roman, who commands the round power of the masonry dome. Then the Gothic artist, who thrusts his vaults upwards: his buildings grow like plants. Baroque elaborates on the Roman; twists, turns, and moves. It is suited to theaters. But we can move in paths of a still greater variety. Our trajectory can be more direct. We have control over forces more abstract and more potent. The investigations of our thinkers are concerned with ethereal radiations and vibrations. It is these that have been manipulated to make possible the whole enterprise of our tremendous industry of sound communication. So it is fitting, almost symbolical, that a great hall of ours, devoted in whatever manner to music, should expand from a focus by waves that follow a great curve, exhilarating rather than serene; and that the great volume of space should depend, for its definition in color and for the various modulations of apparent amplitude or of mood, not primarily on pigment—though the most satisfactory color that is also exciting is this gold—but on intangible light itself. I wish not to exaggerate the pleasure to be had, but I have vowed to record it. 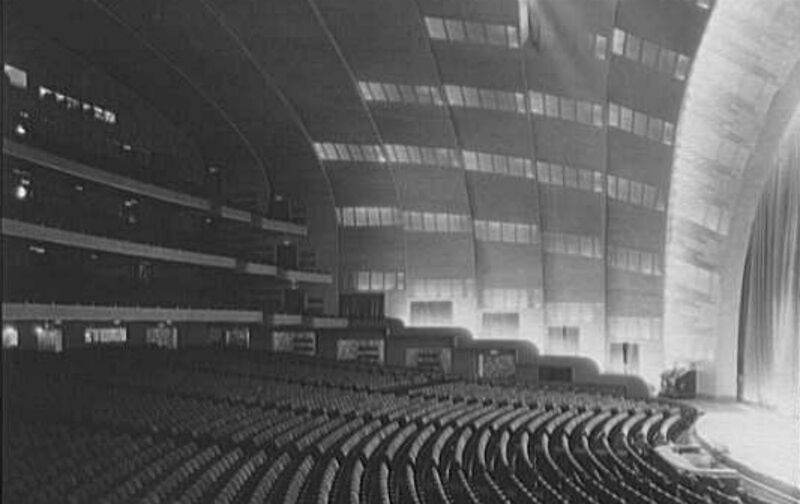 There are skeptics who, having followed the outward history of Radio City, believe that everything connected with it must be essentially absurd. Delight, however, follows its own path, and when or where it will strike is unpredictable.